What conditions does Zovirax treat? Tell your doctor right away if any of these unlikely but serious side effects occur: dizziness, drowsiness, signs of kidney problems (such as a change in the amount of urine, unusual back/side pain), mental/mood changes (such as agitation, confusion, hallucinations), shaky/unsteady movement, trouble speaking. This medication may rarely cause a life-threatening disorder that affects the blood cells, kidneys, and other parts of the body. This disorder is more likely to occur if you have conditions related to a weakened immune system (such as HIV disease, bone marrow transplant, kidney transplant). Seek immediate medical attention if any of these rare but serious side effects occur: extreme tiredness, slow/fast/irregular heartbeat, easy bruising/bleeding, new fever, bloody/dark urine, severe stomach/abdominal pain, yellowing eyes/skin, sudden vision changes, loss of consciousness, seizures. List Zovirax side effects by likelihood and severity. Before using this medication, tell your doctor or pharmacist your medical history, especially of: kidney problems, conditions related to a weakened immune system (such as HIV disease, bone marrow transplant, kidney transplant). What should I know regarding pregnancy, nursing and administering Zovirax to children or the elderly? Does Zovirax interact with other medications? 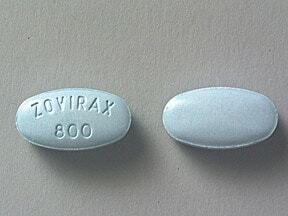 This medicine is a light blue, oval, tablet imprinted with "ZOVIRAX 800". This medicine is a white, shield, tablet imprinted with "ZOVIRAX" and "logo". 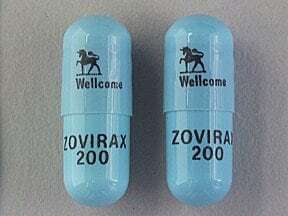 This medicine is a blue, oblong, capsule imprinted with "logo Wellcome" and "ZOVIRAX 200". 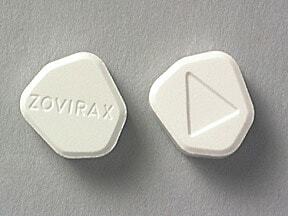 Are you considering switching to Zovirax? How long have you been taking Zovirax?